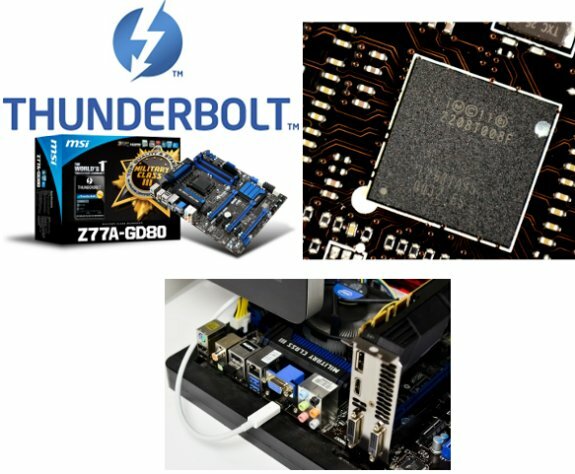 MSI reveals the Z77A-GD80, the first Thunderbolt certified motherboard. The MSI Z77A-GD80, world's first Thunderbolt mainboard, recently achieved full certification by Intel. This ensures MSI's position in a select group of certified Intel Thunderbolt vendors. MSI was also careful to implement the Thunderbolt chip on the mainboard itself. This prevents cable clutter and reduces the possibility of critical failure because of badly installed add-on cards, loose cables or connector failure. Unlike uncertified brands, single port Thunderbolt is the only valid solution for current mainboards, as dual-port solutions cause congestion reducing the overall performance of the Z77 platform. While MSI was already first on the market with a Thunderbolt mainboard and now offers a fully certified solution, ensuring the best compatibility with Thunderbolt devices. As such, Information about the MSI Z77A-GD80 can also be found on Intel's thunderbolttechnology.net website. This Thunderbolt certification builds upon the Military Class III components that were already certified to pass strict MIL-STD-810G tests.